Accommodative spasm (AS) is an asthenopic condition due to prolonged contraction of ciliary muscles. Cycloplegic refraction is the key modality to unmask AS presenting as pseudomyopia along with asthenopia. Management includes determining its underlying etiology and inhibiting the excessive accommodation and excessive convergence using strong cycloplegic agents and bifocal lenses. Recurrence is sometimes associated with AS. In this study, we used cycloplegic refraction in case of pseudomyopia with the presence of aggravating factors and observed the effect of slow weaning effect of atropine eye drops along with the avoidance of aggravating factors to prevent its recurrence. This retrospective case series study was carried in a tertiary eye care hospital in Chennai, India. Sample size: The sample size was eight eyes of four patients. All the patients diagnosed as transient myopia along with the presence of aggravating factors were asked to undergo cycloplegia with cyclopentolate eye drops. If there was shift from myopia to hypermetropia after cycloplegia, patients were started on bifocal or plus glasses along with atropine (1%) or homatropine (2%) eye drops on weekly twice basis and were evaluated two weekly. Eye drops were tapered every month gradually over 3 months and patients were observed up to 6 months [Figure 1]. An 11-year-old female was presented with complaints of sudden onset blurring of vision for distance and near and headache with a history of excessive near work. Ocular examination including extraocular movements was normal [Table 1]. The patient was managed with bifocal glasses with cycloplegic correction and +3.00 add for near vision. She was started on atropine on weekly twice basis (1% eye drops) and was tapered over 3 months. On subsequent visits, there was symptomatic relief and condition resolved. No recurrence was noted over 6 months. A 12-year-old female was presented with complaints of sudden onset blurring of vision for distance and headache with a history of psychological stress. Ocular examination including extraocular movements was normal [Table 2]. The patient was managed with plus power glasses with cycloplegic correction and +3.00 add. She was started on homatropine 2%w/v eye drops on weekly twice basis and was tapered over 3 months. On subsequent visits, there was symptomatic relief and condition resolved. No recurrence was noted over 6 months. A 13-year-old male was presented with complaints of sudden onset blurring of vision for distance and near and headache with a history of psychological stress. Ocular examination including extraocular movements was normal [Table 3]. The patient was managed with bifocal glasses with cycloplegic correction and +2.50 add for near vision. He was started on atropine on weekly twice basis (1% eye drops) and was tapered over 3 months. On subsequent visits, there was symptomatic relief and condition resolved. No recurrence was noted over 6 months. After 6 months, there was again similar episode which was managed with similar protocol. A 12-year-old-male was presented with complaints of sudden onset blurring of vision for distance and near and headache with a history of psychological stress. Ocular examination including extraocular movements was normal [Table 4]. The patient was managed with bifocal glasses with cycloplegic correction and +2.50 add for near vision. He was started on atropine on weekly twice basis (1% eye drops) and was tapered over 3 months. On subsequent visits, there was symptomatic relief and condition resolved. AS is characterized by frontal headache, blurred vision (pseudomyopia), miosis, acute acquired concomitant esotropia (AACE), diplopia, and sometimes macropsia ,, and mostly presents in children and young adolescents. It can be a part of spasm of the near reflex (SNR). Ophthalmoplegic migraine needs to be differentiated from it in the presence of AACE and diplopia. Rare causes reported are bimatoprost induced, secondary to long-standing intermittent exotropia. 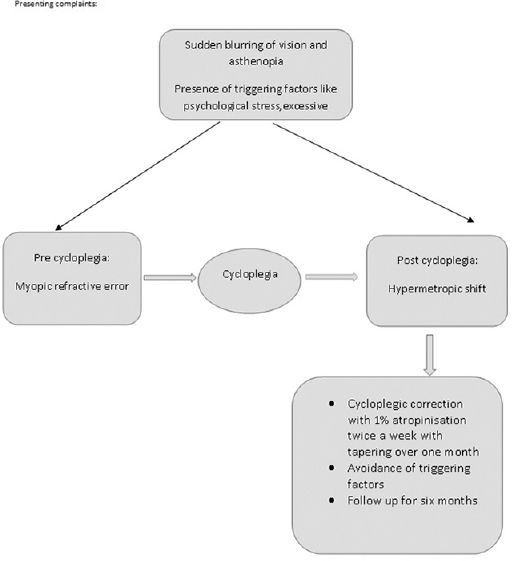 The diagnosis of AS is clinical based on the presence aggravating factors and shift of refraction after cycloplegia. Kanda et al. showed excessive accommodation in AS objectively by open-field Hartmann–Shack wavefront aberrometry. There was an increase in negative spherical aberrations along with more negative average standard deviation refractive power in patients of AS as compared to healthy individuals. Goldstein and Schneekloth showed cases of AS a part of spectrum of SNR and had described five such cases. AS was graded as minimal when small minus and small plus values were present and marked when small plus and high minus values were present. Hussaindeen et al. treated adult onset concomitant esotropia associated with AS with cycloplegics for 1 year and condition resolved completely without recurrence. Rutstein et al. studied 17 cases of AS and treated them with plus lenses, orthoptic exercise, and psychological counseling, but only four cases resolved completely. In our study, we found complete resolution of condition without recurrence which is similar to observations of Hussaindeen et al. Addition of glasses with cycloplegics gives comfortable working vision to the patient. In our case series, we had four cases which were diagnosed on basis of hypermetropic shift after cycloplegia and the presence of predisposing factors such as psychological stress and excessive near work. Atropine (1%) eye drops provided powerful cycloplegia with symptomatic relief; one patient with milder symptoms was put on homatropine instead of atropine. Atropine was started twice a week and was tapered over 3 months. On the 6th month follow-up, recurrence was not noted in any of the patients. After 6 months, one patient presented again with similar complaints due to exposure to psychological stress and was treated similarly. Larger sample size with longer follow-up is required to reach to a definite conclusion. AS can be misdiagnosed as myopia if cycloplegic refraction is not done. Triggering factors also provide key to diagnosis. Slow weaning of atropine prevents recurrence. Lindberg L. Spasm of accommodation. Duodecim 2014;130:168-73. Goldstein JH, Schneekloth BB. Spasm of the near reflex: A spectrum of anomalies. Surv Ophthalmol 1996;40:269-78. Allegrini D, Montesano G, Fogagnolo P, Nocerino E, De Cillà S, Piozzi E, et al. Transient esotropia in the child: Case report and review of the literature. Case Rep Ophthalmol 2017;8:259-64. Hussaindeen JR, Mani R, Agarkar S, Ramani KK, Surendran TS. Acute adult onset comitant esotropia associated with accommodative spasm. Optom Vis Sci 2014;91:S46-51. Iwasaki T, Akiya S, Inoue T, Noro K. Surmised state of accommodation to stereoscopic three-dimensional images with binocular disparity. Ergonomics 1996;39:1268-72. Zimmerman TJ, Wheeler TM. Miotics: Side effects and ways to avoid them. Ophthalmology 1982;89:76-80. Shetty R, Deshpande K, Kemmanu V, Kaweri L. The role of aberrometry in accommodative spasm after myopic photorefractive keratectomy. J Refract Surg 2015;31:851-3. Prakash G, Sharma N, Sharma P, Choudhary V, Titiyal JS. Accommodative spasm after laser-assisted in situ keratomileusis (LASIK). Am J Ophthalmol 2007;143:540. London R, Wick B, Kirschen D. Post-traumatic pseudomyopia. Optometry 2003;74:111-20. Kawasaki A, Borruat FX. Spasm of accommodation in a patient with increased intracranial pressure and pineal cyst. Klin Monbl Augenheilkd 2005;222:241-3. Padhy D, Rao A. Bimatoprost (0.03%)-induced accommodative spasm and pseudomyopia. BMJ Case Rep 2015;2015 pii: bcr2015211820. Shanker V, Ganesh S, Sethi S. Accommodative spasm with bilateral vision loss due to untreated intermittent exotropia in an adult. Nepal J Ophthalmol 2012;4:319-22. Kanda H, Kobayashi M, Mihashi T, Morimoto T, Nishida K, Fujikado T, et al. Serial measurements of accommodation by open-field hartmann-shack wavefront aberrometer in eyes with accommodative spasm. Jpn J Ophthalmol 2012;56:617-23. Rutstein RP, Daum KM, Amos JF. Accommodative spasm: A study of 17 cases. J Am Optom Assoc 1988;59:527-38.